IMBUS of the kidneys is important in the hospital and clinic. 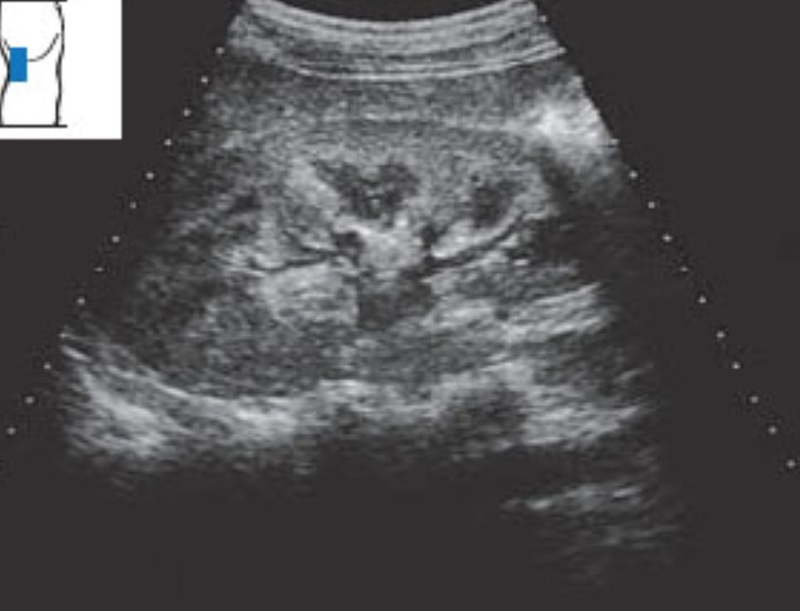 Adrenal gland abnormalities can be seen incidentally when the kidneys are imaged. IMBUS of the kidneys is most frequently needed in clinic for the question of hydronephrosis. However, it is important to identify some additional kidney diseases. The adrenal glands are small and near the kidneys, so large lesions in the adrenal need to be recognized during a kidney exam. Ultrasound is not sensitive for evaluating adrenal glands so we do not need to worry about increasing the diagnosis of small incidentalomas. However, spotting a larger adrenal mass can be an important finding for some patients. The kidneys lie in the retroperitoneum, behind all other abdominal organs, and really are shaped like “beans”. However, these beans are not identically shaped and are rotated medially. The left kidney may lie more cephalad than the right kidney. The vessels in this region were covered in a previous chapter but are labeled again in this frontal anatomy diagram. The cephalad portion of the kidney is tilted posteriorly. 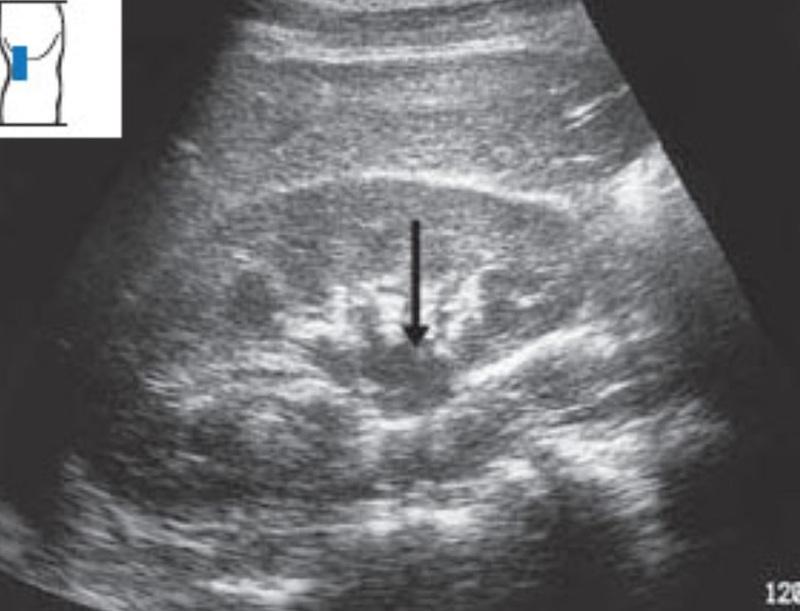 Notice in the following image, shown from the examiner’s view of a lateral decubitus patient, that the most caudal intercostal space on each side usually gives a long axis, coronal view of the kidneys. 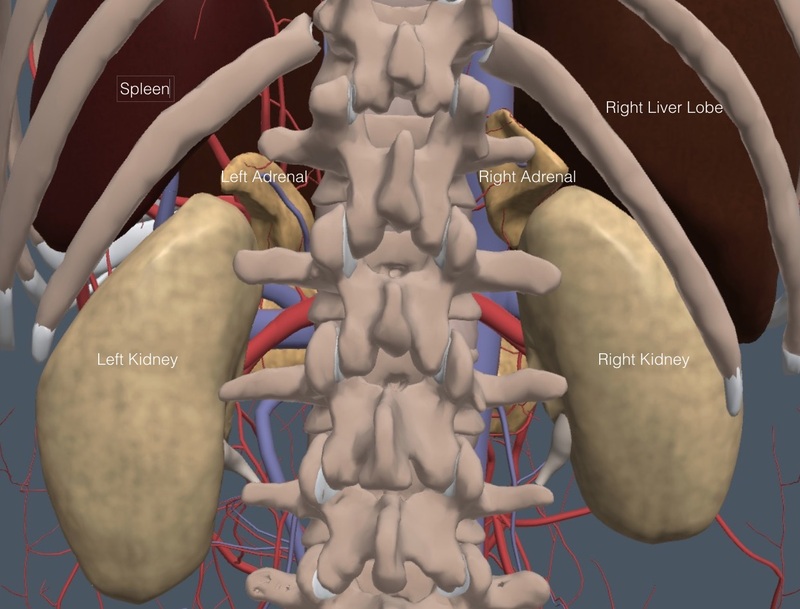 Ribs cover the upper third of each kidney. The liver is cephalad and anterior to the right kidney and the spleen is cephalad to the left kidney as shown in the next image. Medial to the kidneys are the psoas muscles and directly posterior are the quadratus lumborum muscles, along with adipose tissue. The kidneys move up and down on these muscles during respiration. 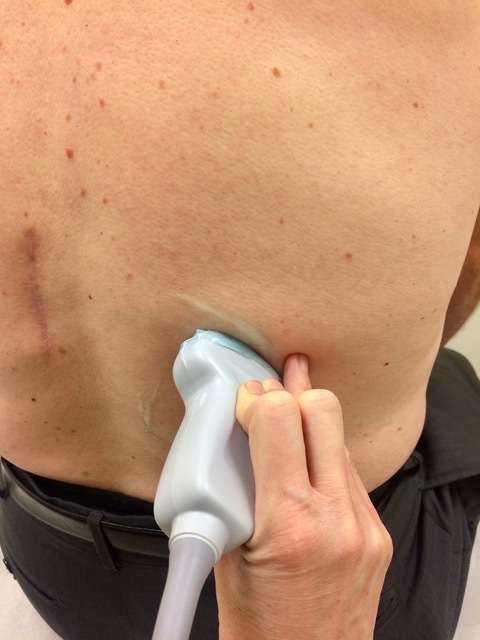 Ultrasound can usually penetrate the posterior tissue and give good views of the kidneys from the back. This posterior long axis view is parasagittal, rather than coronal. Here is the posterior anatomy. A section through a normal kidney shows three microscopic areas. The central portion, usually called the renal sinus, consists of the calyces, fatty tissue, and the renal pelvis. The next zone out is the renal medulla, which is made up of the medullary pyramids, separated by renal columns. Most external is the renal cortex. With IMBUS, the renal sinus is a single hyperechoic area. The medulla and renal cortex together form a peripheral more hypoechoic area called the parenchyma. 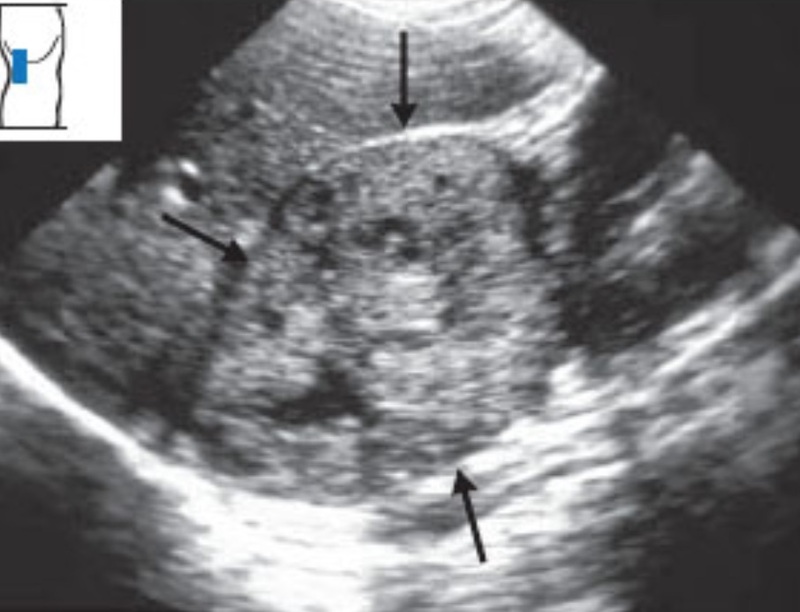 The medullary pyramids, when accumulating urine, are seen as small, anechoic areas in the inner parenchyma. Here is a still image of a normal kidney with the areas labeled, including a medullary pyramid. The right kidney may be seen through the liver with a subcostal or intercostal approach but in most patients lateral intercostal and true posterior views are better. This window is described first because it is less well known. However, this view should be considered a back-up view if the lateral intercostal views are poor. Have the patient sit with her back toward you (the same window could be obtained in a lateral decubitus position with a patient who could not sit up). Find the most caudad and medial rib with your fingers and apply gel below this rib up to the costovertebral angle. 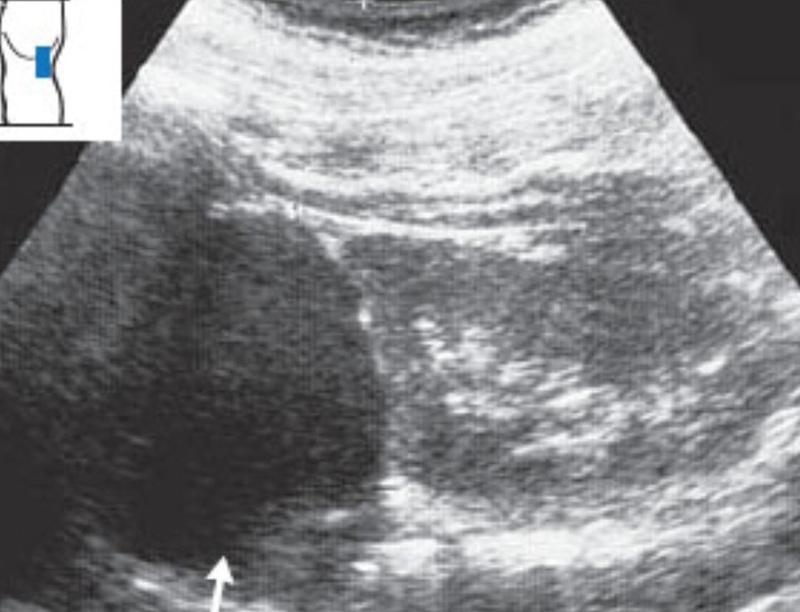 The curvilinear probe, indicator obliquely cephalad, is placed as in the following image on a patient’s right side. 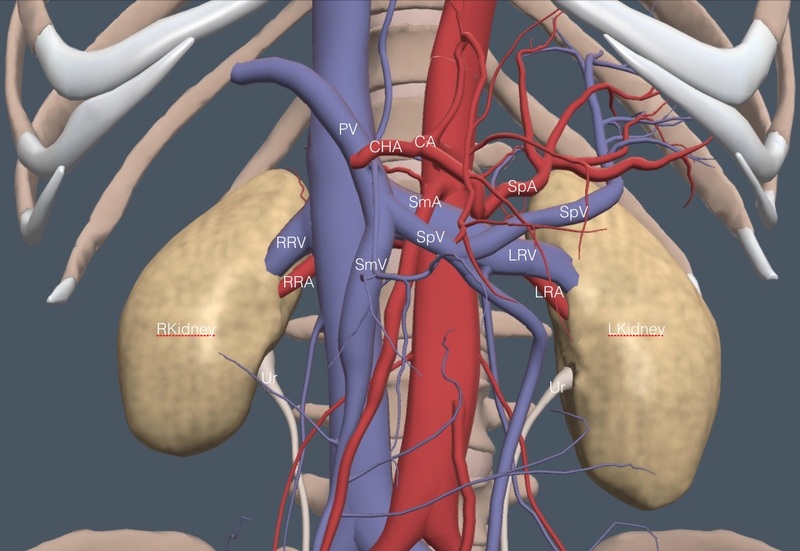 Move around below the rib in this region to find the kidney and optimize the long axis view. Here is a clip of a kidney in the posterior window. There are no interfering ribs. The hyperechoic sinus and hypoechoic parenchyma are nicely seen, along with a few medullary pyramids. Optimize the depth and the gain. The renal sinus should be hyperechoic and the parenchyma hypoechoic but not black. 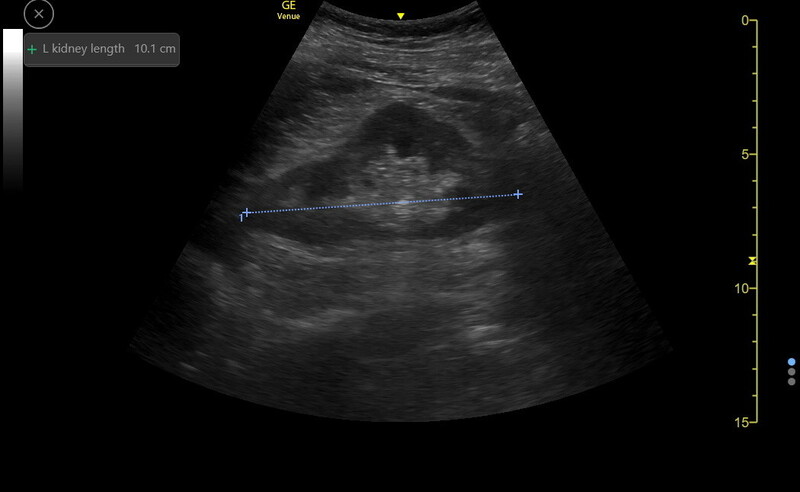 When the long axis view is optimized, freeze and measure the longitudinal dimension of the kidney as in the following image. The kidney width is usually not needed. Normal adult kidneys vary with patient height but in general are between 9-12 cm in length. The other worthwhile measurement of the kidney is the width of the renal parenchyma. Measure from the hyperechoic outer capsule to the beginning of the hyperechoic renal sinus in the middle of a kidney. This means measuring past any medullary pyramids, as in the following image. Choose the thickest parenchyma to measure. Normal renal parenchyma width is between 1.4-2.4 cm and varies with the patient’s size. There is gradual shrinkage of the parenchyma and kidney length with age and chronic renal disease. Parenchyma can also become more hyperechoic in some renal diseases. After measurement of the kidney in the long axis, fan/slide through the kidney in this plane, making sure to see the hilum on the medial side where the ureter and vessels enter and leave. Don’t miss a dilated ureter, which can be the first sign of hydronephrosis. As a practical rule, an IMBUS exam should not be able to visualize a normal ureter, so any “vessel” medial and posterior to the kidney that does not have color Doppler flow should be considered an enlarged ureter. Rotate the probe to a transverse view with the indicator examiner left and fan/slide through the length of the kidney. Repeat the process on the left kidney. This approach is optimized with the patient in the right and left lateral decubitus positions. Use fingers to find the most caudal intercostal space on the patient’s side and put the probe in the most anterior part of this space. Here are the hand and probe positions for the lateral intercostal view of the left kidney. Rotate the probe slightly to get the best long axis view. Sometimes the rib shadows prevent a clear view of the whole kidney. The views of the kidney and the measurements that are obtained are the same as described above for the posterior view, except that the kidneys are now being viewed in the coronal plane instead of parasagittal. The longitudinal and transverse surveys and views would also be the same as with the posterior view. 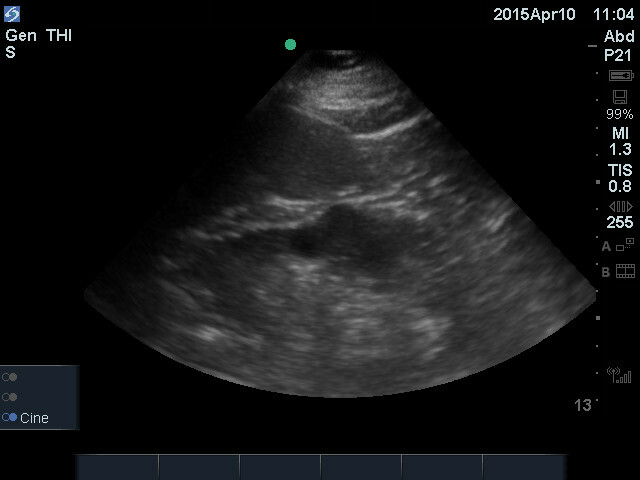 The hilum should be visualized with color Doppler, excluding a dilated ureter. The hilum is usually a little easier to find with the lateral view compared to the posterior. Large kidneys: Kidneys can be large in acute nephritis and occasionally in early diabetic nephropathy and amyloid renal disease. The parenchyma is often more hyperechoic in these conditions as well, but be sure the gain is set correctly using surrounding tissue. 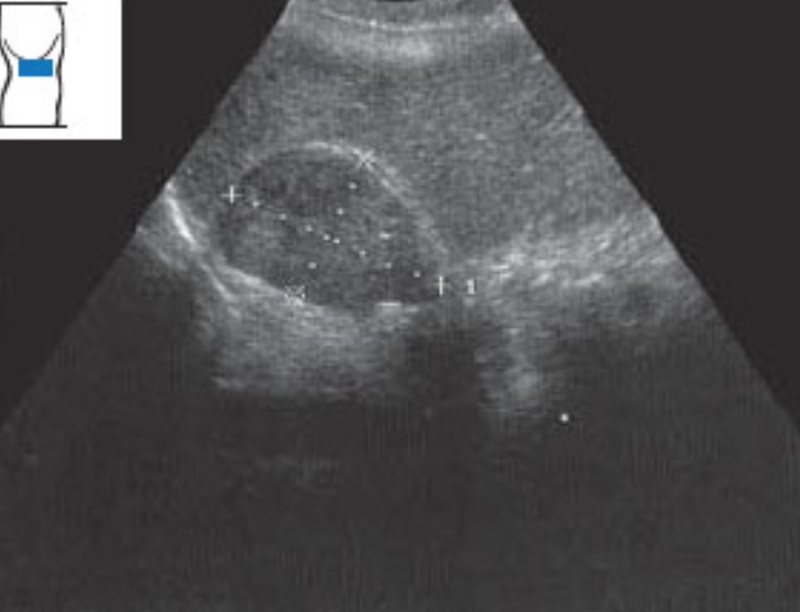 Here is an image from a patient with acute SLE nephritis showing increased echogenicity of the parenchyma. The kidney measured greater than 12 cm in length. Small kidneys: Small kidneys usually indicate chronic intrinsic renal disease, chronic infection, or the result of renal artery stenosis, particularly if only one kidney is small. If a small kidney is congenital, the contralateral kidney is usually hypertrophied. It is mostly a loss of parenchyma that reduces the size of the kidney. The following is a patient with late stage diabetic nephropathy with an 8 cm kidney and a parenchymal width < 1 cm. Horseshoe kidney: This is a congenital malformation in which the lower poles of both kidneys are joined together by a parenchymal bridge that crosses up and over the aorta as a hypoechoic structure. The lower poles of each kidney don’t taper normally and they look indistinct in the standard views. Here is an image of a clinic patient that shows the hypoechoic parenchymal bridge crossing the aorta (caliper A) caudad of the renal arteries. The bridge was 1.6 cm thick and could be seen to run posterior on each side of the aorta when viewed live. The aorta itself is caliper B in the image. A horseshoe kidney by itself causes no kidney trouble, but it can be associated with other genitourinary abnormalities so it is worth noting. Kidney stones: Stones in the kidney appear in the renal pelvis or calyces and can be difficult to see because this area is already hyperechoic, so the stone does not stand out. Only an acoustic shadow from the stone may distinguish it. To accentuate a shadow, reduce the gain somewhat. Here is an image of a kidney with a stone casting a shadow. Also notice the nice edge artifact on the right side of the image. There are reports that color power Doppler will cause kidney stones to light up and “twinkle”, even when there is no shadow, but we do not have a clip of this to show but it may be worth putting a power Doppler sector over the kidneys when stone disease is suspected. Hydronephrosis: Basic hydronephrosis was covered during IMBUS-Core, but here is a little more detail about some aspects. The following diagram depicts the progressive severity of hydronephrosis. 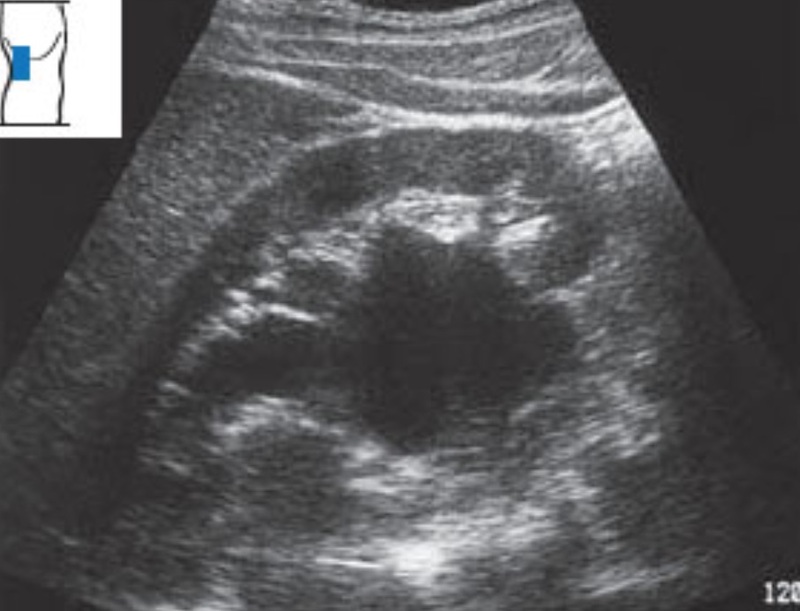 In mild hydronephrosis, the ureter and renal pelvis first dilate with urine. The calyces and medullary pyramids are still normal in size. The ureter comes medially out of the hilum and runs caudad toward the bladder. That means the hilum of each kidney must be identified carefully. 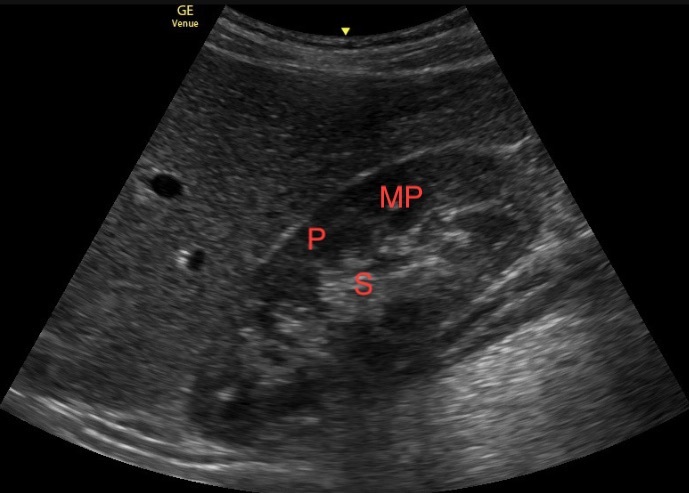 If a dilated ureter cannot be found, be skeptical of diagnosing hydronephrosis. Here is a clip of a patient with mild to moderate hydronephrosis. This is a lateral intercostal view of the right kidney. The dilated ureter can be seen posterior and heading caudad in this right kidney. The renal pelvis was dilated but the calyces were barely dilated. The dilated ureter is important because normal adults can show some urine in the renal pelvis when they are actively forming urine, but the ureter is never dilated. Here is a still image from a normal adult with good urine in the renal pelvis and medullary pyramids but there was no ureteral dilation. Ureteral dilation is also important for differentiating a congenital condition called “ampullary pelvis” in which the renal pelvis is dilated but the calyces and ureter are normal. Here is an example. This would be a difficult call, but seeing that the medullary pyramids were normal, along with no dilated ureter should create hesitation in diagnosing hydronephrosis. A decision must be made with each patient about whether it is better to over-call or under-call mild hydronephrosis. 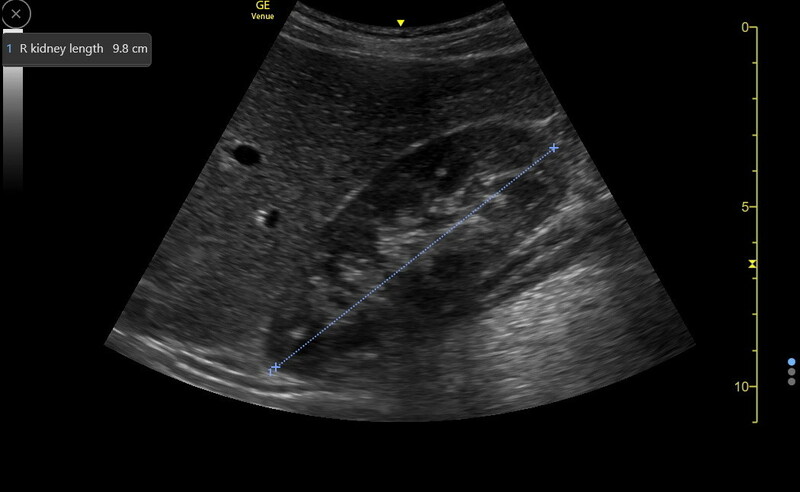 Uncertainty about early hydronephrosis might lead to confirmatory CT or formal ultrasound in some patients, but sometimes a patient can drink 250-500 mL of fluid over a fairly short period of time and come back in several hours to be re-examined. The patient could also come back the following day to be sure that hydronephrosis was not progressing. In the next chapter, ureteral bladder jets will be discussed as an aid for decision making with possible early hydronephrosis. 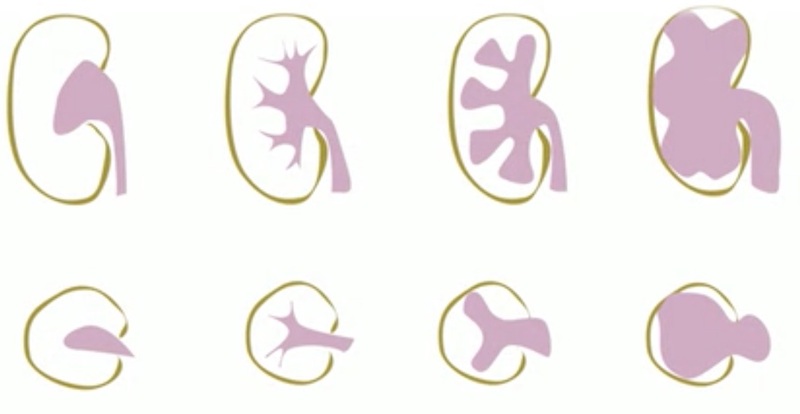 As hydronephrosis increases, the major calyces, the minor calyces, and the medullary pyramids eventually dilate and finally begin to compress the renal parenchyma. 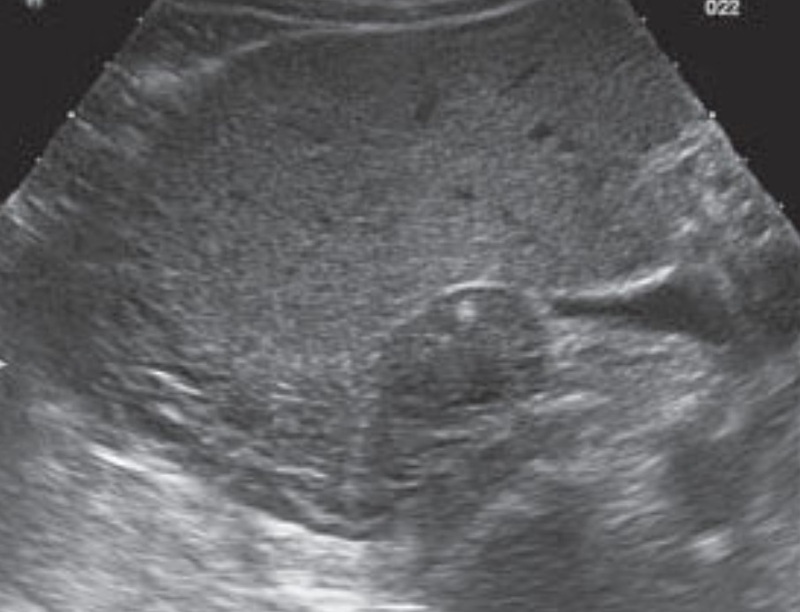 Moderate hydronephrosis becomes an easier diagnosis but make sure the ureter is dilated. Here is moderate hydronephrosis with an easily seen dilated ureter. 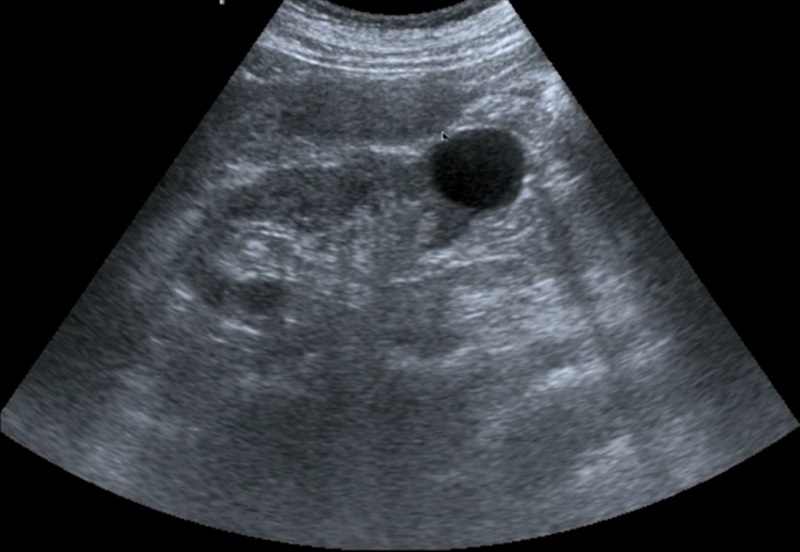 Severe hydronephrosis is usually easy to identify, as in the following clip, but never forget the dilated ureter (not well seen in this clip) to be sure that this isn’t severe polycystic kidney disease (polycystic disease should be bilateral) or multiple and large parapelvic cysts (see below). 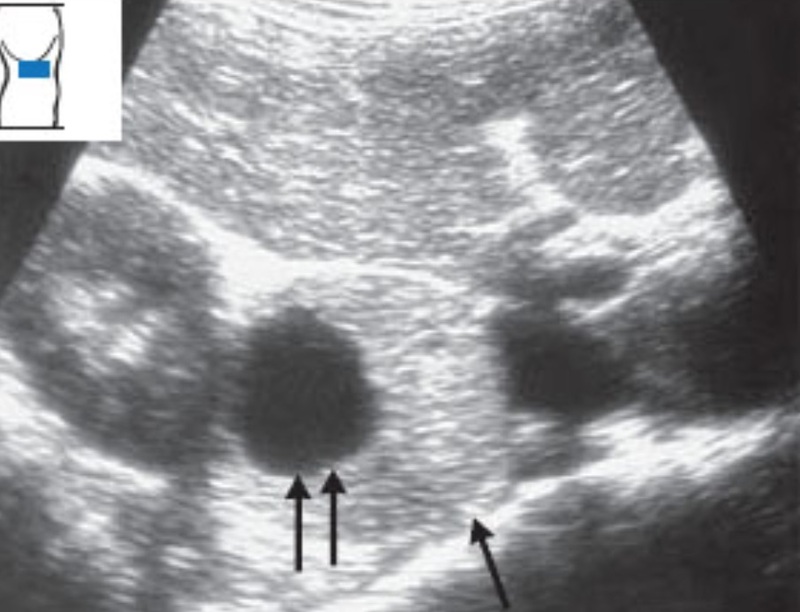 A warning about left sided hydronephrosis: rarely, a large aortic aneurysm can cause obstruction of the left ureter, so in middle aged or elderly patients the aorta should be imaged in patients with left sided symptoms suggesting renal colic when any degree of hydroureter or hydronephrosis is seen. Summary IMBUS clinic approach to possible kidney stones: Kidney stones < 5 mm in size cause symptoms but rarely obstruct a ureter, don’t seem to benefit from tamsulosin therapy, and don’t need instrumentation. Thus, a patient with symptoms consistent with a kidney stone but normal kidneys and ureters by IMBUS can be treated with simple pain medication and hydration at home while observing for stone passage and symptom relief. These patients could have early clinic followup and would usually not need a CT scan. Conversely, a patient with symptoms suggesting ureteral stone and mild or greater hydroureter and hydronephrosis should proceed immediately to CT because the location and size of the stone dictate how quickly urology might need to be involved. Obviously, the CT would also confirm the stone diagnosis and allow treatment with tamsulosin to begin. Renal cysts: Pure, simple cysts are always benign and usually clinically silent, although hemorrhage and acute pain can rarely occur in these cysts. However, make sure there are no complex features. Cysts that have complex features and are over 2 cm should have CT imaging. Simple cysts can be multiple and are completely anechoic with no internal echoes if the gain is correct. There should be posterior acoustic enhancement and often lateral wall shadows. They should be round or oval in shape and have a thin, sharp posterior wall. Simple cysts can bulge off of a kidney (pararenal), be in the cortex (cortical), or be in the renal medullary area (parapelvic). Here is a single, simple pararenal cyst off of the lower pole of a kidney. The cyst is round with no internal echoes, slight posterior acoustic enhancement, and a lateral wall shadow. A large, hypoechoic medullary pyramid could cause confusion with a parapelvic cyst, but look for a cyst to be anechoic and to have posterior acoustic enhancement. Here is a clip of a parapelvic cyst extending out into the cortex. There is definite posterior acoustic enhancement. Cysts can be very large, but as they become multiple and bilateral the worry is about polycystic kidney disease and confirmatory imaging is needed (either contrast enhanced CT or MR). Renal masses: This is a difficult topic. There is no information about screening for renal tumors with ultrasound. Most renal tumors are considered dangerous and finding them early is seen as a benefit. In asymptomatic patients, such tumors are found incidentally. There is a normal renal variant with a hypertrophied renal column (columns of Bertin) that make physicians worry about cancer, although the tissue is completely isoechoic with the rest of the renal parenchyma, which would rarely be the case with a renal neoplasm. Consistent with American College of Radiology guidelines, solid renal masses less than 1 cm in greatest diameter are not biopsied and even when found by CT are followed at 3-6 month intervals by CT/MR until they are over 1 cm. Thus, an IMBUS-identified renal mass that is clearly less than 1 cm can be followed with IMBUS at 3-month intervals for size change. Any mass that becomes greater than or equal to 1 cm should get an MR, which will help decide biopsy or direct resection. Hypernephroma/renal cell carcinoma is the greatest fear. Such tumors can be hyperechoic or hypoechoic, are inhomogeneous, can cause a bulge in the renal outline, and are often scalloped along the border. Here is a left kidney in which a hypoechoic bulge greater than 1 cm was identified and was diagnosed as a clear cell renal carcinoma. Unfortunately, the left kidney may infrequently have a benign malformation called a “dromedary hump” which is a little bulge opposite the border of the spleen, as in the following image. This is normal kidney tissue so it should be isoechoic with the rest of the parenchyma. The decision to get confirmatory CT or MR would be difficult. Here is a clip showing a more ominous, larger lesion that is bulging and with a mixture of hyperechoic and hypoechoic elements. This was also a renal cell carcinoma. Angiomyolipomas are hyperechoic parenchymal lesions reminiscent of the “snow ball” angiomas in the liver and spleen. These could be distinctive enough to be diagnosed as benign and not pursued, but confirmatory US would be obtained when a lesion was not distinctly hyperechoic. Normal adrenal glands are 3-7 cm in length and lie cephalad and medial to the kidneys, as in the following view from the back of a patient. The right adrenal lies posterior to the liver and just lateral to the IVC. The left adrenal is posterior to the spleen and lateral to the aorta. Only in unusual clinical circumstances might we attempt a whimsical exam focusing on the adrenal glands, knowing that CT or MR are far better for such imaging. An adrenal gland abnormality with IMBUS would almost always be seen incidentally as part of a kidney, liver, or spleen exam. It makes sense that adrenals might be seen with a posterior kidney exam, but this has not been described in ultrasound literature. The important thing is to realize where the adrenal glands lie when we are doing kidney, liver, and spleen exams. Definitely get the patient in the left lateral decubitus position. Get the long axis right kidney and the liver in the same image and then subtly fan the probe anterior to bring in the slightly hyperechoic triangle of tissue cephalad and medial of the right kidney but posterior to the liver. The right adrenal should always remain lateral to the IVC. 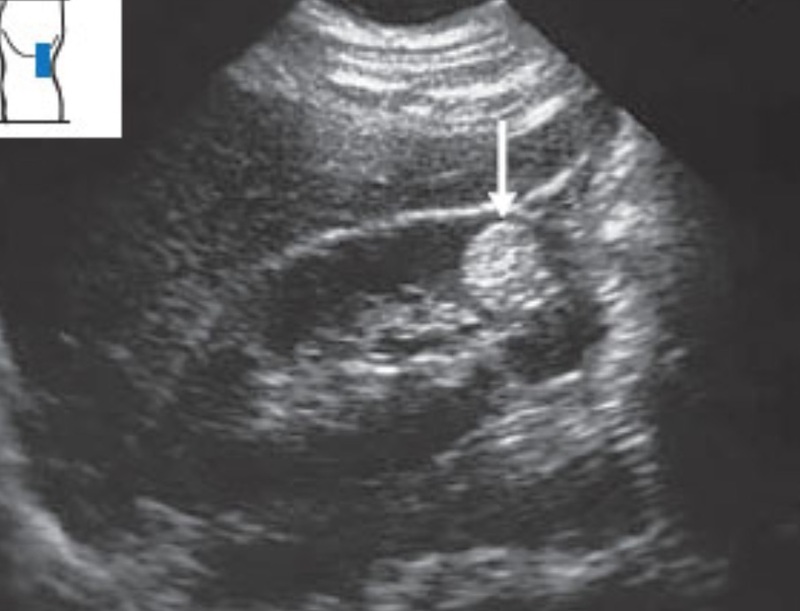 If the IVC is seen, the view is too medial. 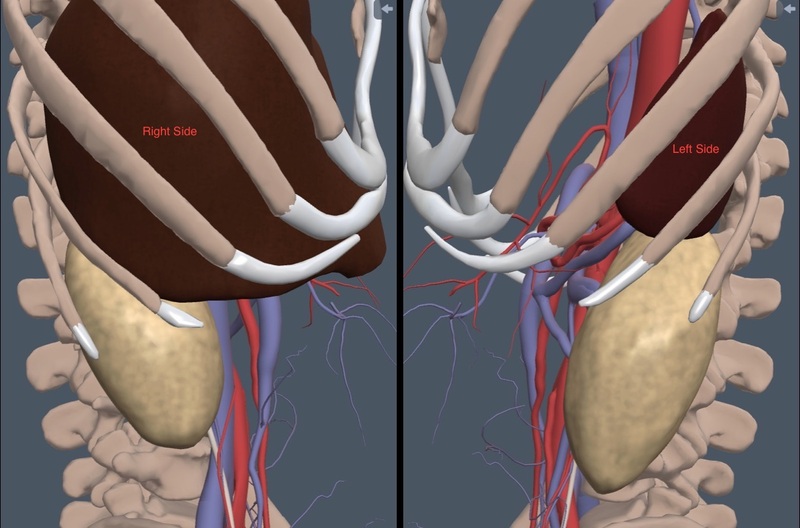 Here is a clip showing a triangular normal right adrenal gland as it comes in to view cephalad and medial to the kidney and right against the liver. In this image the tissue is more hyperechoic than the liver and kidney and a bit “sparkly”. Using the right lateral decubitus position, the left adrenal gland is cephalad to the long-axis left kidney, posterior to the spleen, but still lateral to the aorta. The left adrenal gland is harder to see because the splenic acoustic window is smaller and the stomach contents often create trouble. 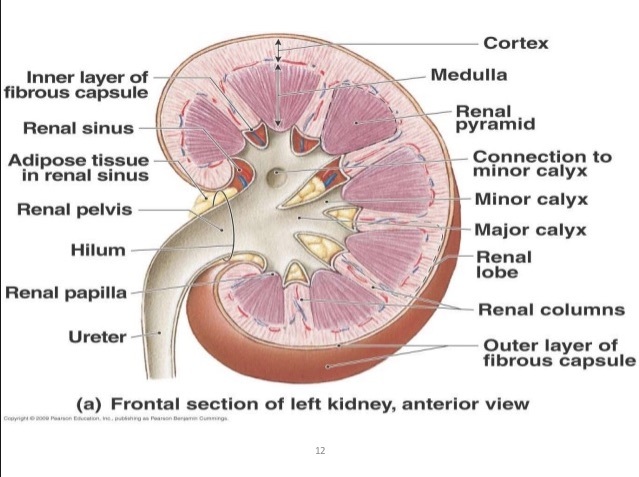 The spleen and kidney need to be in the same image with the probe fanned anterior to bring in the tissue medial and cephalad to the left kidney. The view is too medial if the aorta is viewed. Here is a clip showing a normal left adrenal gland under ideal conditions. 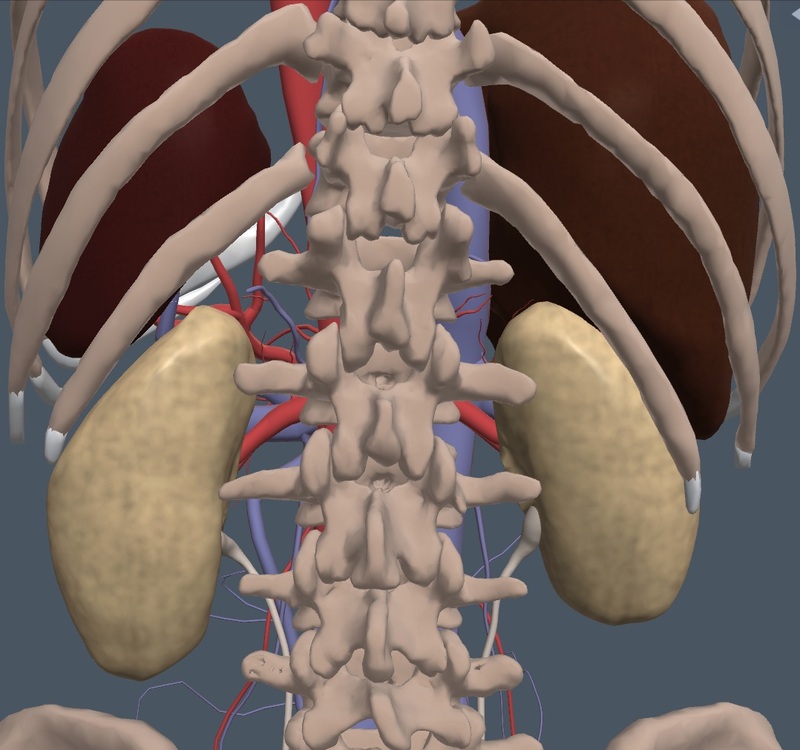 The triangle of tissue is seen between the spleen and the almost-disappearing left kidney as the probe is fanned medial. The stomach is right below the adrenal gland on the screen. An IMBUS exam can probably only visualize an adrenal mass larger than 1 cm and at this point, malignancy and hormones are the issues. The malignancy pathway is determined by a patient’s history of cancer and the CT/MR size and appearance. Thus, the IMBUS rule must be that lesions greater than 1 cm would go to CT or PET/CT (with a history of cancer). Patient symptoms might clearly suggest hormone disturbances, but catecholamines, cortisol, and mineralocorticoids are the worries. A patient could have a 24-hour ABPM to establish normal blood pressure and pheochromocytoma would then be highly unlikely and catecholamine measurements would not be needed immediately. A normal serum potassium argues strongly against pursuing mineralocorticoid excess. A 1 mg overnight dexamethasone suppression test is probably needed to eliminate the possibility of cortisol excess. Adrenal cyst: Adrenal cysts can be of any size. Larger cysts may interfere with function in that adrenal. Here is a large adrenal cyst pushing up against a kidney. Adenomas: Solid lesions large enough for IMBUS viewing could be benign or malignant and may be functional or not. Hormonal abnormalities would be sought first if a solid lesion is seen. Surprisingly, a large registry found that even “non-functioning” adrenal adenomas over the long term had a higher incidence of diabetes and cardiovascular events, suggesting that some of these adenomas may have low-level function causing long-term harm despite lab results within the normal range. Here is a fairly large, non-functioning right adrenal adenoma. Pheochromocytoma: Pheochromocytomas can be small to large. 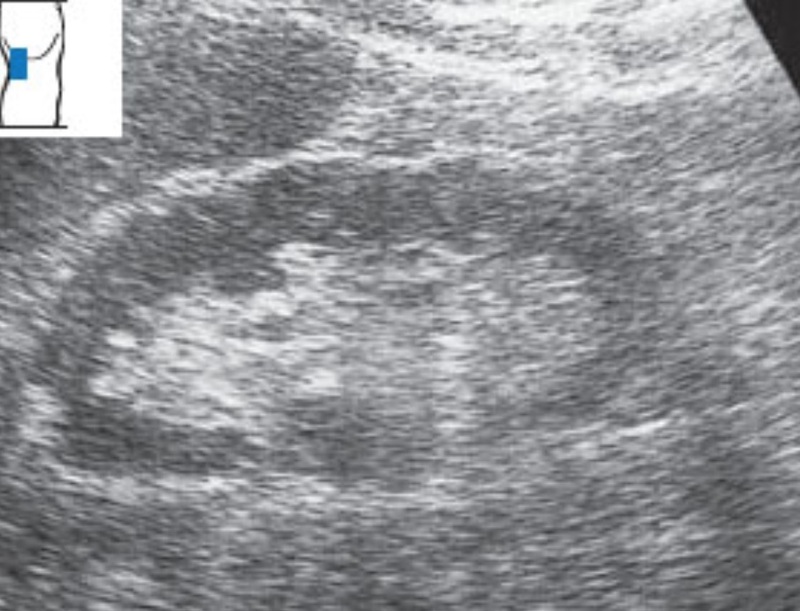 IMBUS would not detect small ones, but this is an image of a large pheochromocytoma with cystic and solid parts. Metastasis: Adrenal metastasis is classic in small cell lung cancer but can also occur in other tumors. IMBUS can’t differentiate a metastasis from other benign or malignant lesions. Here is a left adrenal metastasis from small cell lung cancer that was pushing up into the spleen. Primary carcinoma: Adrenal carcinoma is unusual and may or may not secrete hormones. Patients might just have weight loss and anorexia. Here is an example.